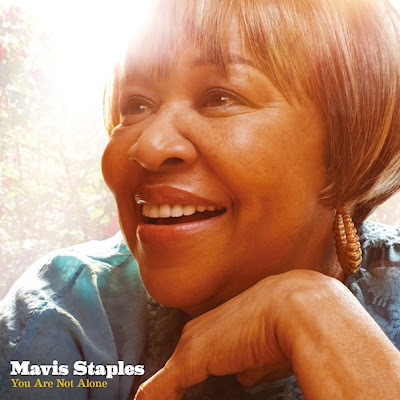 I've been looking forward to the musical collaboration between Wilco's Jeff Tweedy and gospel-soul legend Mavis Staples for months. The result, "You Are Not Alone," is available now for you to buy, and I hope you do buy it for yourself and everyone you know. These two artists, though far different from each other in age, race, and personal experience, have forged a bond that makes perfect sense. In the past year, I have been fortunate enough to see both Wilco and Staples perform here in Seattle. If you read the reviews (here and here), they articulate a bit about why I find them so special. Mavis Staples and Jeff Tweedy are American treasures, and I don't say that without all my heart behind it. You want to see some deeply talented folks who have been through some tough stuff, dealt with the world spotlight and all the pressures of that, and still come out good? There you go. Tweedy and Staples are having some fun here on The Colbert Report (video courtesy the lightning-fast The Audio Perv). But even Stephen gets that he's lucky to be in the house, and is uncharacteristically sincere and genuine towards the end of the first piece.